Biscotti are twice cooked Italian biscuits. You cook them first as a log, and they come out of the oven a soft cookie texture. After cutting them into slices you cook them a second time. This time they end up dry and crunchy, and perfect for dunking into a coffee or hot chocolate. This version of the recipe uses almond and coconut flour to make them gluten free, maple syrup to avoid refined sugars, and no eggs to make them Vegan and Vegetarian. 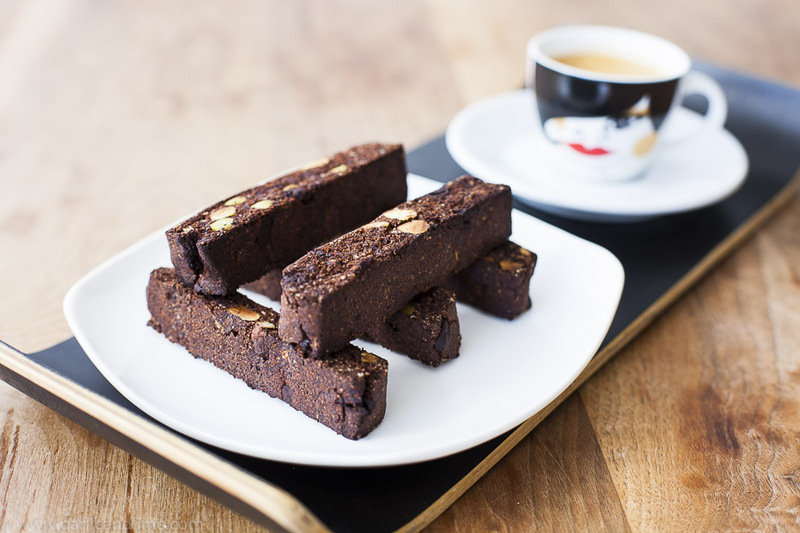 Despite being a significant variation on the traditional recipe they are a delicious, crunchy Biscotti that are no shame to the original recipe. The almond flour gives them a lovely richness that makes them feel more sinful than they are! The mixture should start to form into a ball. Let it rest for 5 minutes for the coconut flour to absorb the maple syrup. Place a sheet of greaseproof paper on a baking tray and place the mixture in the middle of the tray. Shape the mixture to form a block about 20cm long, 10 cm wide, and 2 cm thick. Cook the biscotti in the oven for 15 minutes. Slice the log into 1cm wide biscuits using a bread knife. It is important that they are even in width as you are going to cook them again.